The Department of Energy’s 2017 budget request was released back in February, and is now awaiting congressional approval. The request included $261 million for the Advanced Manufacturing Office (AMO), the part of DOE that focuses on energy use in the manufacturing sector. It does so by bringing together manufacturers, research institutions, suppliers, and universities to promote manufacturing clean energy products and implementing best practices. 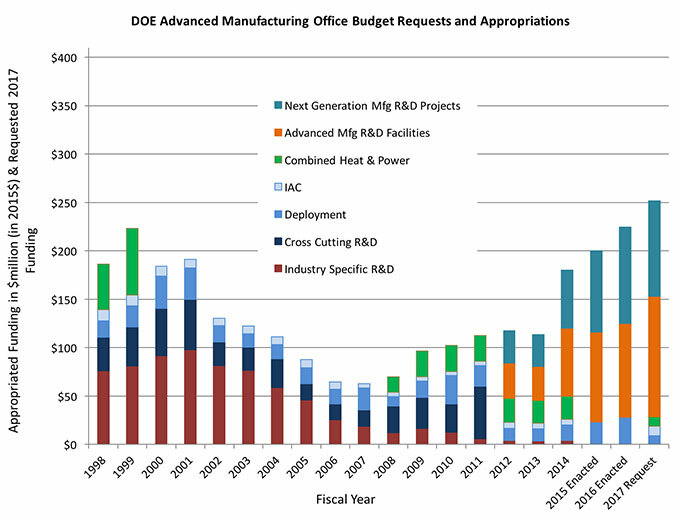 The increase, over prior years, of the AMO budget allocation demonstrates a continuing interest and commitment by the federal government to invest in energy efficiency in the industry sector, especially in helping energy-intensive manufacturers reduce their energy use and develop new, energy-efficient technologies, processes, and products. The AMO budget request is divided into three subprograms: Advanced Manufacturing R&D Projects ($102.5 million), Advanced Manufacturing R&D Facilities ($129 million), and Industrial Technical Assistance ($29.5 million). The R&D Projects subprogram request includes $10 million for projects at the Manufacturing Demonstration Facility at Oak Ridge National Lab, and the bulk of the budget, $40 million, would be invested in competitive solicitations. The R&D Facilities subprogram plans to concentrate its efforts on new and continued funding for Clean Energy Manufacturing Innovation Institutes, specifically highlighting the first annual payment for a new Energy-Water Desalination Hub. The Technical Assistance subprogram allocates $10 million each in continuing support for the Combined Heat and Power Technical Assistance Partnerships and the Industrial Assessment Centers (IACs). The request continues a long history of government support for industrial energy efficiency and advanced manufacturing. The graph below compares annual investment in AMO activities dating back to 1998 (adjusted to 2015$) and a breakdown of the programs funded. The 2017 request represents a 14% increase over last year’s allocation for AMO and is one piece of the administration’s overall request for a 40% increase for the Office of Energy Efficiency and Renewable Energy. While the budget allocations have fluctuated over the years, this year’s request represents a firm commitment by DOE to invest in the development of energy-saving research and technology. Earlier this month, AMO’s director, Dr. Mark Johnson, shared more details on the office’s future plans during a meeting of ACEEE’s industrial working group. Dr. Johnson highlighted upcoming efforts relating to water desalination, specifically encouraging the development of technology, scientific research, and manufacturing that can increase the efficiency of desalination without an increase in cost or energy usage. He also emphasized the work of the IAC program, which is celebrating its 40th anniversary. Through the program, teams at 24 of the top US engineering schools have conducted more than 16,000 energy assessments, helping manufacturers save more than $1 billion in energy costs, enough energy to power 1.4 million homes. A solicitation is currently open to determine which universities will host the 24 IACs for the next five years, and DOE will invest approximately $35 million in those centers over that period. If you’re interested in becoming involved in ACEEE’s industrial working group, send an email to industry@aceee.org and request an invitation to join. The group is an informal committee of stakeholders that convenes periodically, primarily to discuss federal policy issues affecting the industrial sector. AMO staff and industry partners will showcase best practices and leading energy efficiency solutions at DOE’s upcoming 2016 Better Buildings Summit in Washington, DC. The Summit will be held on May 9–11, and will include 900 participants and speakers from the commercial, industrial, public, multifamily, residential, and data center sectors. Industrial topics will cover water-saving technology and projects, smart manufacturing, data analysis, and energy savings related to heating/cooling, steam, pumps, process heating, and compressed air. Dr. Johnson and ACEEE’s senior director for research, Neal Elliott, will be featured panelists on the first day of the summit, during the Better Plants Partner Meeting: Key Trends and Future Directions in Industrial Energy Efficiency session. Other staff from the ACEEE Industry Program will participate in panels, including Ethan Rogers, who will discuss supply chain efficiency, and Christopher Russell, who will discuss how to value the multiple benefits of efficiency.